This is medicine I could have used the past month…but I’m sad to say I only got on my bike for the first time this season yesterday. Even though I live in the high country, and the nearby ski station of Vail (30 miles away) only closed for the season yesterday, we’ve still had some warm days and clear roads and trails (at least in Eagle, where I live) for the past 3–4 weeks. I’ve been watching cyclists ride up my street from my office window for the past month. What kept me off my bike? Too.Much.Work! The past 6 weeks has probably been the busiest I’ve ever been in my life. If you have followed what we’ve been doing over at the Indoor Cycling Association, you know about the Indoor Cycling Summit. While we actually began working on this 6 months ago, it was the past 6 weeks that were in earnest. And…may I brag for a moment? The result has been truly amazing. We’ve created a stunning collection of webinars that I believe every instructor in the world would benefit from watching. It would raise the bar of instruction around the globe if all instructors took part. And, only 3 of us created it all (not counting our top notch presenters who wrote and recorded the sessions); John Chappell, Tom Scotto, and me. Each of us had many many nights until 3 or 4 am with early mornings the next day, day after day. But don’t worry, this is not a sales page. That paragraph is from the heart! But as a result of this intense focus, my fitness and sanity have suffered substantially (and I’m sure the other two would agree), not to mention my waistline and posture. (I did have my cycling classes twice a week though, and those surely kept me from going completely bat $h*t crazy)! 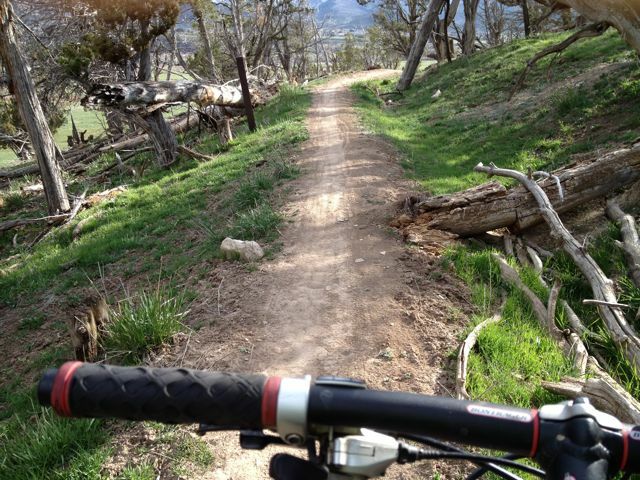 So my bike ride yesterday, on Easter Sunday, was as cleansing emotionally and mentally as it was needed physically. It was the single greatest feeling I could have possible undertaken and I came home a new person. I cannot let work get in the way of my mental sanity to that level again! 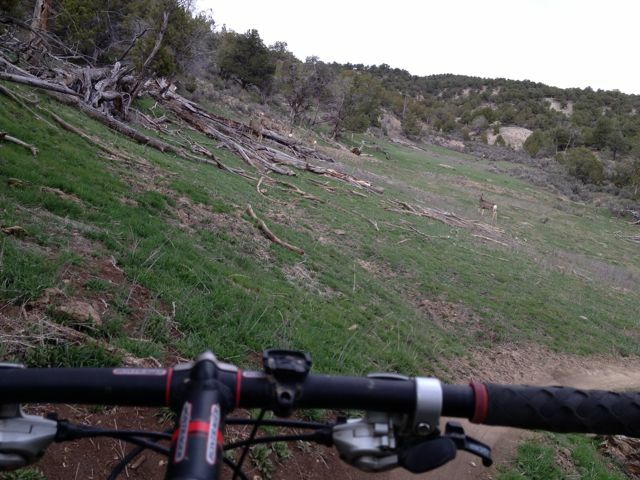 That photo above was one of my views on my mountain bike ride. Below is another one. Can you see the seven deer watching me? They are well hidden, in front of and behind the large downed tree. I won’t let that happen again….going that long without a bike ride when Mother Nature gives me beautiful days to be outside! I want to share with you a great article on the mental benefits of riding a bike from Bicycling Magazine, by Selene Yeager. 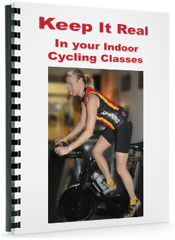 Those of us who teach Spinning® and/or ride bikes outside will say “of course we know this!” You can use this as further reason to convince your students the need to continue coming to your classes. Below is the article in part. To read the rest, go to Bicycling Magazine. Every morning Canadian neuroscientist Brian Christie, PhD, gives his brain an extra boost. We’re not talking about tossing back multiple strong shots of espresso or playing one of those mind-training games advertised all over Facebook. “I hop on my bike, go to the gym for 45 minutes, then ride the rest of the way to work,” says Christie. “When I get to my desk, my brain is at peak activity for a few hours.” After his mental focus sputters to a halt later in the day, he jump-starts it with another short spin to run errands. Ride, work, ride, repeat. It’s a scientifically proven system. In a recent study in the Journal of Clinical and Diagnostic Research, scientists found that people scored higher on tests of memory, reasoning, and planning after 30 minutes of spinning on a stationary bike than they did before they rode. They also completed the tests faster after pedaling. Exercise is like fertilizer for your brain. All those hours spent turning your cranks create rich capillary beds not only in your quads and glutes, but also in your gray matter. More blood vessels in your brain and muscles mean more oxygen and nutrients to help them work, says Christie. When you pedal, you also force more nerve cells to fire. As these neurons light up, they intensify the creation of proteins like brain-derived neurotrophic factor (BDNF) and a compound called noggin (yes, really), which promote the formation of new brain cells. The result: You double or triple the production of neurons—literally building your brain, says Christie. You also release neurotransmitters (the messengers between your brain cells) so all those cells, new and old, can communicate with each other for better, faster functioning. This kind of growth is especially important with each passing birthday, because as we age, our brains shrink and those connections weaken. Exercise restores and protects the organ, says Arthur Kramer, PhD, a neuroscientist at the University of Illinois at Urbana-Champaign. “Our research finds that after only three months, people who exercised had the brain volume of those three years younger,” says Kramer, referring to a study that examined the brains of 59 sedentary volunteers between the ages of 60 and 79 who either did an exercise program or were inactive for six months. Loving Hills Outdoors is Not as Easy as Indoors!